Hi Everyone! Welcome to Wandering Camera. 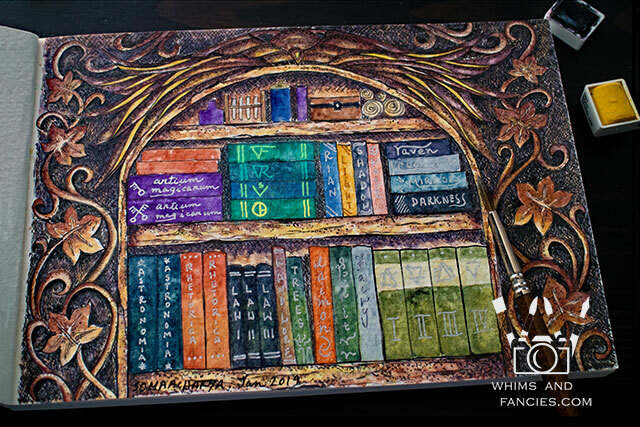 I am really excited to share photos of this painted bookshelf with you this month. 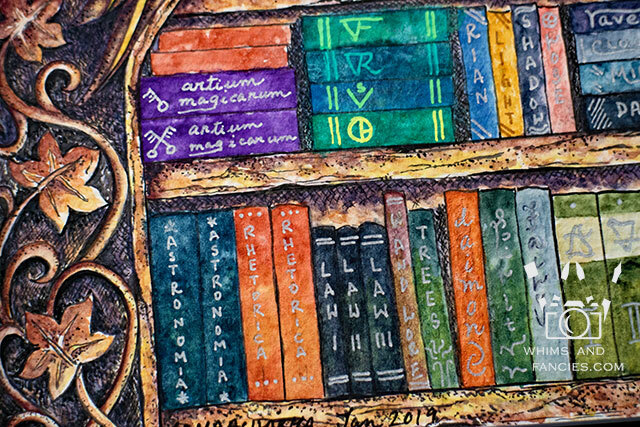 I love the romantics of magic and decided to embark on a journey of painting a magic alphabet series. I chose B for bookshelf. Specifically, a magician’s bookshelf. I love to and tend to do a lot of research for my work. I had a fantastic time looking into alchemy and magic. 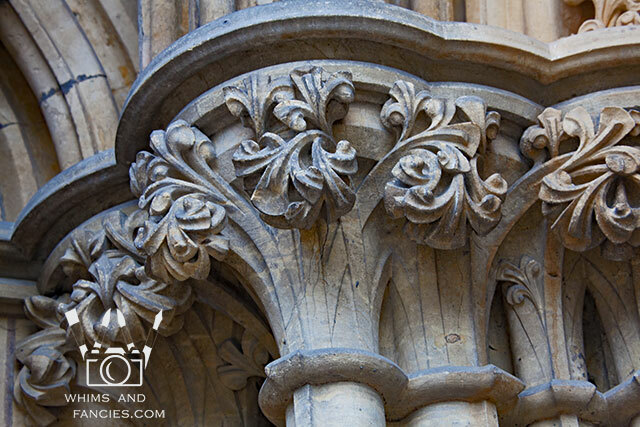 I looked into my vault of travel photos for stonework depicting vines and leaves. Nothing says magic to me more than stone. These are two of the photos I used for reference. 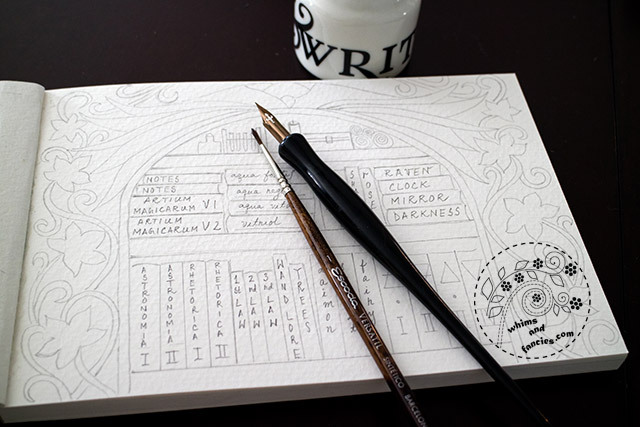 Before I started inking the drawing, I practised on a separate piece of paper with a dip pen. Unfortunately, the rough surface of the cold press paper that I used kept catching the pen too much, causing very uneven lines instead of the smooth and controlled lines that I wanted. I switched to a very small brush which glided easily on the paper. 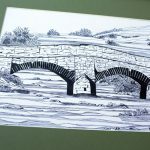 I was able to create controlled and tiny strokes for the cross hatching using waterproof Speedball Super Black india ink. However, inks are very harsh on brushes. I learned that the hard way after almost destroying the first one. Brushes need to be cleaned quite often with a good brush soap. Also, instead of my gentle watercolour brushes, I will be using a little stiffer acrylic ones for inking. It took me awhile to draw those tiny cross hatch marks. It was quite meditative. Then, early December, I started painting. I wanted the stone bookshelf to be illuminated by candlelight. Using warm yellows and warm browns, gently and slowly, I finished painting the bookshelf. I thought of painting all the books in one colour, but that seemed very boring. Magic should be exciting! So I decided to match the colours of the books with their titles. I would love to paint this bookshelf larger one day and add more details to the book spines. 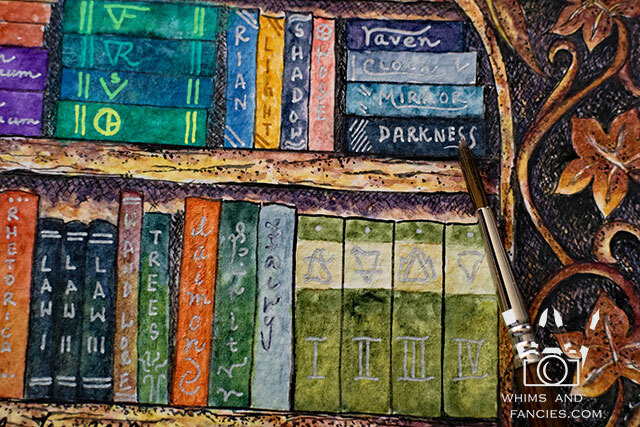 The ancient and wise raven watches over both the books and the magician. Even though she is candlelit, she also glows from within. Quoting my friend Dixie – a bibliotheque filled with books on practical magic, spells, and alchemy. I would so love to take a peek at these books. If only I was also made of ink and paper! Thank you for sharing your photos and stories too. I love reading them! All photography and creative themed posts are welcome. You can add any number of links to your posts, or write a new post to link up. Please link back by either adding the badge or a text link back to this site on each post that you link up. You can also add the badge to your blog. Wandering Camera is a monthly event that runs on the last Thursday of every month. If you follow me via email, you will get a reminder. I love this so much! The detail in it is wonderful and your research is fabulous. What a fabulous finished work! Wow! Thanks for linking up to My Corner of the World! Soma – it is so interesting to me how the vines around the edge seem to be three-dimensional – a testimony to your talent! I remember seeing this at the start, and I love seeing the finished product! 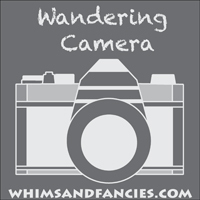 I am glad to be linking up to Wandering Camera again! You are so talented, I always enjoy seeing your work! At first glance, I thought it was a photo of a tile or some kind of wall art with embossed leather for the sides. 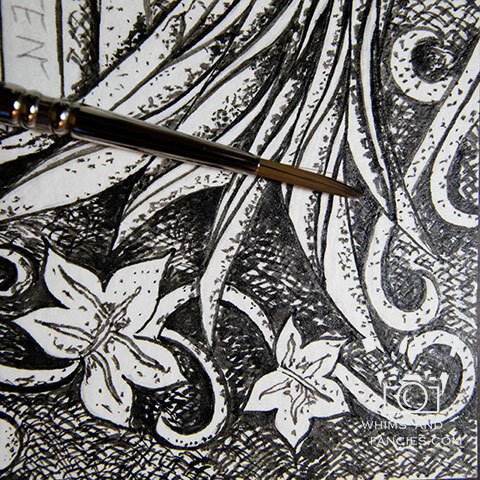 You have wonderfully steady hands to make precise lines with a brush. So cool. Thanks for describing your process. It adds to the magic of your painting. 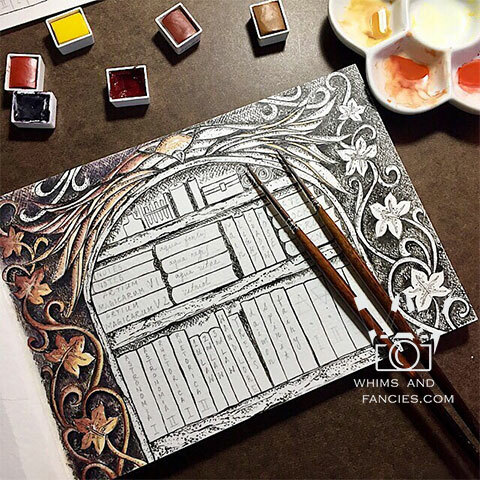 Your love of art and the creative shines in your amazing bookshelf and books, Soma. You intuit magic! 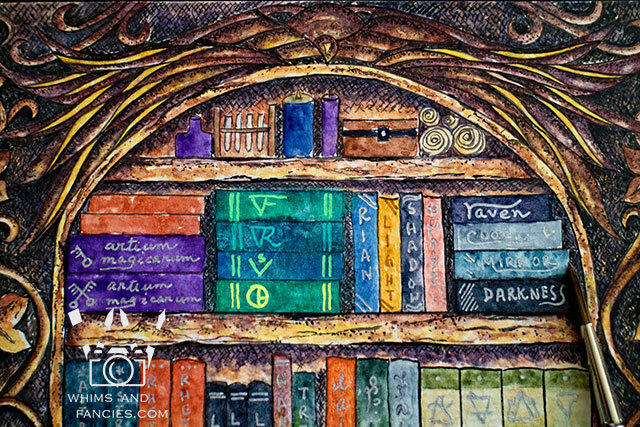 So happy you choose to paint the books in luminous colour…they glow.As for your bookshelf…just wow! A most amazing painting! Like seeing the progression and thoughts behind the development. You created a wonderful image. 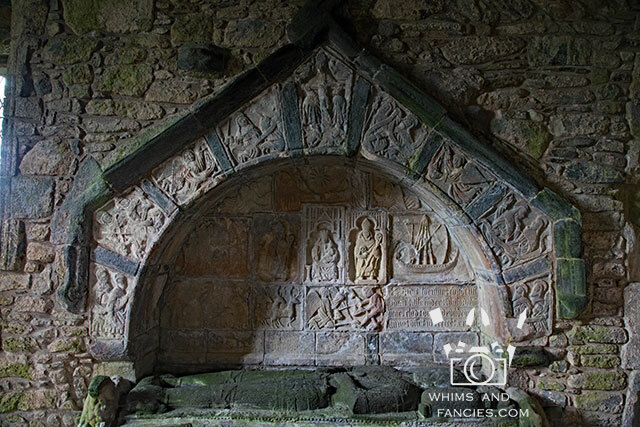 Lovely artwork -the carving in the Scottish church is fascinating, you couldn’t help but be inspired by it! You lady…are so talented! What a beautiful painting! I’d say magic made it to the paper with flying colors! I think the dimples within the paper adds to the adventure of this piece. A beautiful study that i’m so glad you shared with us all. The derails and thoughts you put into this piece are incredible. 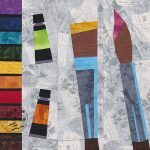 I enjoyed reading about the use of inks with your brushes. It will be hard to top this one. 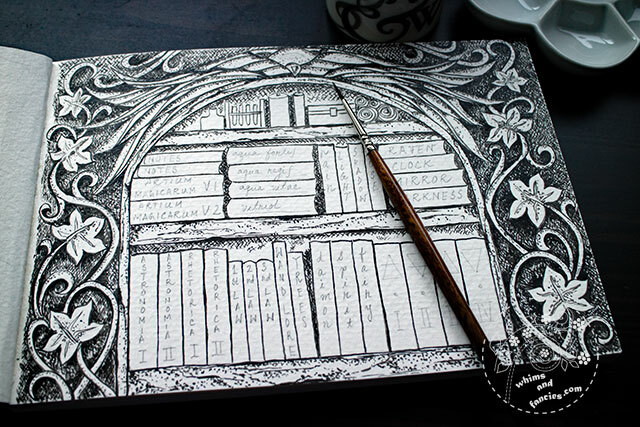 I absolutely love it, all the elements really jump off the page…one might say magically. ;) Happy PPF! How beautiful! I loved seeing your painting progress! this is just so beautiful, and all your time and attention to all the details shows! happy PPF! O my! Before my eyes I see magic. You chose such lovely colours for your bibliotheque. Fabulous finish, Soma! Such a wonderful magical piece. 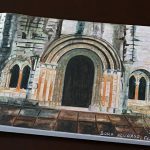 I enjoyed your post of photos for inspiration and listening to how you found your way with inks and brushes, and what worked and did not. I also enjoyed the details shots that show how much meditative love went into this. So beautiful! I’d love to read the books, too. Wow! Beautiful and fantastic drawing and coloring! Soma, what a stunning image! I love the candle light bringing out details in the stone. Wouldn’t it be marvellous to be able step inside, look through the books, then settle comfortably just outside the image to read. Wow! Outstanding painting! And all the time and research put into it. Very impressive! Thanks for sharing. Oh what Dixie said! I was thinking that this painting is probably my favourite to date of yours, and how I want to go into it… and how you’ve captured the glow…I can FEEL this painting, almost smell the air in the bibliothèque, the scent of those books, feel their what’s the name parchment (thank you, my brain) under my gentle fingers…sense the expectancy in the air…I love magic, as you know! The detail here is exquisite, as you can gather from my words. Bravo! I’m not a magician, bur I have a lot of books too. 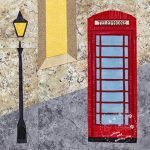 Wow – fabulous painting! That bookshelf is pure magic!